Today I found out that the first man to walk in space almost got stuck out there. 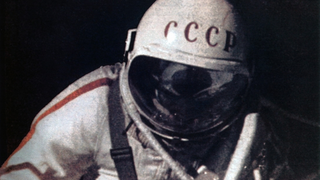 That lucky individual was Alexei Leonov, who was born in the Soviet Union on May 30, 1934. He was one of the twenty Soviet Air Force Pilots to be chosen for the first cosmonaut group. Originally, his historic walk was supposed to have happened on the Vostok 11 mission, but as that was cancelled; it was later performed on the Voskhod 2 mission instead. After eighteen long months of training for the event, Leonov was ready to become the first person to walk in space. You are simultaneously hurtling around the Sun at 66,600 mph while sitting on a “rock” that is spinning at about 1,070 mph. On top of that, our whole solar system is rocketing through space around the center of the Milky Way at about 559,234 mph. On top of that, our galaxy is hurtling through space at about 671,080 mph, with respect to our local group of galaxies. On top of that, for all we know, our entire universe is hurtling through some medium at some other ridiculous speed. Either way, you’re moving really, really fast right now while reading this. Slow down you crazy kids with your rap music. Emily Upton writes for the wildly popular interesting fact website TodayIFoundOut.com. To subscribe to Today I Found Out's “Daily Knowledge” newsletter,click here or like them on Facebook here.